UPDATE: Make sure to check out my most up-to-date General Conference singing time posts HERE. I always LOVE to take the week before Spring General Conference and have a General Conference themed singing time. I never have time in the fall because we are always reviewing for the upcoming program. I begin my lesson with Latter-Day Prophets. If your songbook is outdated (like mine! ), make sure to print off the current version HERE for you and your pianist. 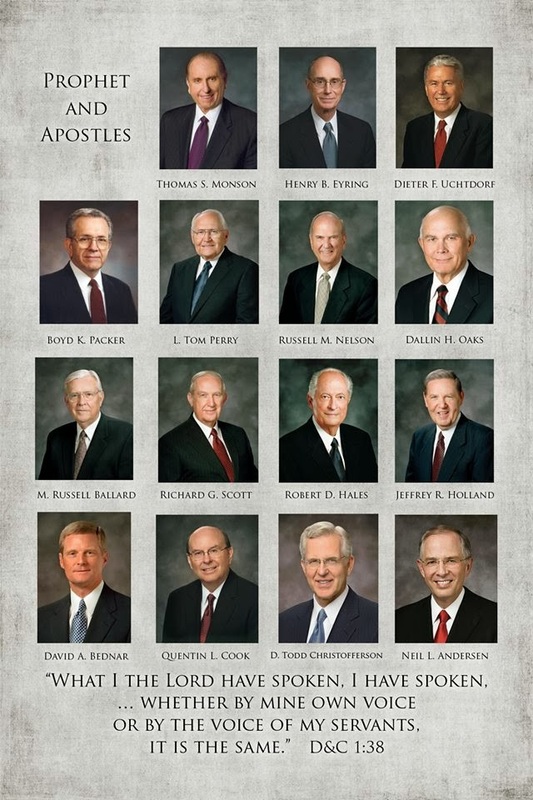 I keep all the pictures of the prophets (with their names typed up at the bottom) in a binder (you can purchase the pictures from the Distribution Center, print a document HERE (scroll down) or there are pictures found in the Gospel Art Book (GAB) but they are just smaller). Next up is the Living Prophets Song set to the tune of Book of Mormon Stories. Find music with words HERE. I like to have all the pictures hung up on the chalkboard with magnets, but out of order. It will be the kids' job to put them in order. As we put each picture in order, I'll read a LITTLE (and be quick about it) information on each of the apostles foundHERE. Then sing in between. UPDATE: I've found a YouTube Video found HERE that is an option for an updated version of this song but it doesn't include the first presidency which I don't really like. 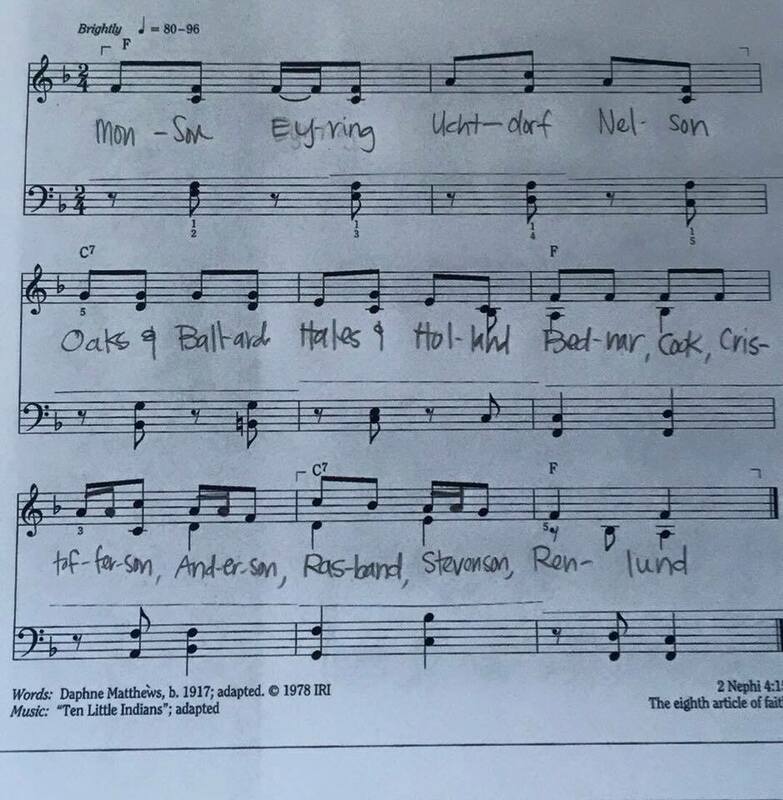 Or someone on the chorister's FB group posted this picture. I'm sorry, I don't know where credit is due but I think I like this version better than the YouTube video. Does anyone have some piano skills on the computer and put this into actual music we can download?? Again, I purchased these from the Distribution Center You can find them HERE online. Having these just to use for my own little family during General Conference has been fun - we hang them all over the fireplace mantel and point to each one when they speak - making purchasing them TOTALLY worth it! Last year I played General Conference Singo with the below JPEG. It was a lot of fun too! Find more details on that lesson plan HERE. So, here's to a week off - hooray for General Conference and going to church in my living room in my jammies!! I love this idea! Would you share more specifics on how you fit the current apostles names to the tune, please. I can't get it to fit. Thanks! 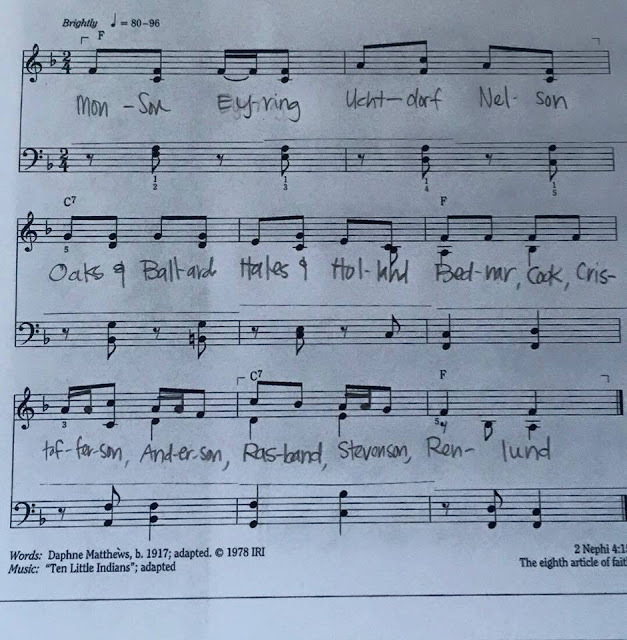 Hi Laura, I added to the post more specifics on how to fit the names into the tune. I hope it helps!! Thank you. That helped me figure it out. We sang The Books in the Book of Mormon using the last names of the First Presidency and the Quorum of the 12 and the kids LOVED it. We sang progressively faster and we clapped for the younger kids who couldn't read. The teachers thought it was super clever and everyone had a fun time. Thanks for the great idea!! HI! love all these wonderful ideas, thank you for sharing. i am using the Living Prophets PDF with the info about them. I didn't know if you have an updated list of the 3 new apostles, or if you could send me the file so i could update them with the same format. Thank you again for your awesome ideas and work. I've updated the post to include a few things I've searched - it's not great but hopefully it helps! Camille, you are with us each week in primary...you are one of the reasons I agreed to accept the calling when I thought I could not take on one more thing! Your website has saved my sanity and helped prepare our sweet kiddos each Sunday for the week ahead. Our testimonies have grown and our faith has developed as we have learned new songs and relearned songs in new ways!!! Do you have updates to your cute factoids on the new apostles? I can't find the updated apostles for these cards...help? "Next up is the Living Prophets Song set to the tune of The Books in the Book of Mormon. Find music with words HERE. I like to have all the pictures hung up on the chalkboard with magnets, but out of order. It will be the kids' job to put them in order. As we put each picture in order, I'll read a LITTLE (and be quick about it) information on each of the apostles found HERE.."